On February 13th, 'Nothing has been proved' is released as a single for Dusty Springfield, written by the Pet Shop Boys, produced by them and Julian Mendelsohn and taken from the film Scandal. They have actually written two songs for Dusty for the film – the other which the film-makers pass on because they think it sounds too contemporary, is called 'In Private'. Meanwhile they are busy producing – with Julian Mendelsohn – an album for Liza Minnelli. On June 29th, the Pet Shop Boys begin their first tour, visiting Hong Kong, Japan and Britain, playing 14 dates in all. 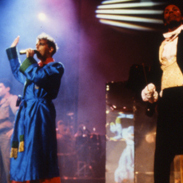 The tour, a lavish theatrical spectacle is directed by film-maker Derek Jarman. He has specially shot several films to be back-projected, there are extravagant costumes and the cast includes six dancers (Casper, Cooley, Hugo Huizar, Tracey Langran, Jill Robertson and Robia LaMorte), four singers (Mike Henry, Jay Henry, Carroll Thompson and Juliet Roberts), an extra keyboard player (Dominic Clarke) and a percussionist (Danny Cummings). "They asked for a theatrical concert and that's what we're doing", says Derek Jarman. "I suppose some people think pop music and theatre shouldn't mix but I think pop music is theatre and I don't see why it shouldn't be so. To my mind, there's two ways of doing it – you either just sit there and sing on a stool and do it the simple way or you go for it". On June 26th, 'It's alright' is released. They originally heard the original version – by Chicago House artist Sterling Void – when one of them popped out during the recording of 'I get excited' (The B-side of 'Heart') and bought 'Acid Tracks: The House Sound Of Chicago Vol. 3' on CD and were both immediately impressed by this song. For a single they re-record it in a more poppy style and Neil adds a verse about the threat facing the world environment. "It's about the power of music. It's a bit cosmic really – it's saying that if people still make music then there's always going to be a good side to what people do so mankind is never going to be totally destructive. It's very sincere and there's something about the song that makes perfect sense. It has this beautiful line: 'I can hear it on a timeless wavelength, never dissipating and giving us strength'. I think that's true. Music is an inspiration to people and always has been an inspiration to people. Music represents the good side of mankind; music tends to be a good force rather than a bad force". The first single from the Pet Shop Boys' collaboration with Liza Minnelli, a hi-energy version of Stephen Sondheim's 'Losing My Mind', is released. It is her first hit single. The collaboration was the idea of an executive in the American branch of Epic Records. Together they record an entire LP 'Results' (released in October). "I just put it completely in their hands, the ultimate trust", says Liza. "It's weird, because I've been working for 30 years and to find somebody who you like enough and trust enough and respect enough to say forget it, I'll do whatever you want is quite amazing"
The Dusty Springfield single 'In private', written and co-produced by the Pet Shop Boys, is released on November 20th. "It's about someone having an affair with a politician and being found out", Neil explains, "the politician is saying different things in public and in private". 'Getting away with it', the first single by Electronic, the group formed by New Order's Bernard Sumner and The Smith's guitarist Johnny Marr, is released on December 4th. The words are co-written by Neil who also sings on the record and appears in the video. The collaboration came about after Neil sends a message through a mutual friend earlier in the year saying that he'd like to be involved. Both Neil and Chris also travel to Manchester to collaborate on another song called 'Patience Of A Saint'.